CAWC, Inc. is the Philippines' pioneer and sole manufacturer of technical grade sodium tri-polyphosphates (STPP) and tetra-sodium pyrophosphates (TSPP) for the Philippine detergent industry. In 1972, under its original corporate structure named Polyphosphates, Inc., (PPI) then a wholly-owned subsidiary of Chemical Industries of the Philippines Inc., it built the first polyphosphates plant . At the outset the Company produced only STPP and only for the use of the detergent industry as "builder" in their formulation i.e. " to prevent the redeposition on fabrics - of the soil from the wash water. In 1984, PPI - by then a joint venture company with Albright and Wilson Ltd., of the United Kingdom with a 40% ownership in the Company, erected one of the first phosphoric acid plants in the Asean region. Its phosphoric acid plant was a vertical integration project. Now, it produces not only technical grade for CAWC's own requirements in the manufacture of STPP and TSPP - but food grade phosphoric acid for the food and beverage industries as well. It also manufactures carbon dioxide (CO2 ) - another product that it delivers to the beverage industry. 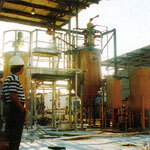 In 1994, it proceeded with the implementation of the long-contemplated CO2 plant. The CO2 plant was erected both as an environmental project and as a commercially viable venture. Its main contribution to the environment is it recovers the carbon dioxide gas - that ensues from the manufacturing process of STPP/TSPP when it involves the use of soda ash to recover. Now, this plant also contributes to the Company's bottom-line as it manufactures CO2 which is sold to the beverage industry. In 2003, CIP bought the shares of its joint-venture partners and CAWC became 100% owned by CIP. Each of these manufacturing activities are registered activities under the Philippines' Board of Investments Law with proper incentives as priority projects. These plants are all located in Barrio Kalawaan, Pasig, Metro Manila.